"Moloch! Moloch! ... monstrous bombs!" 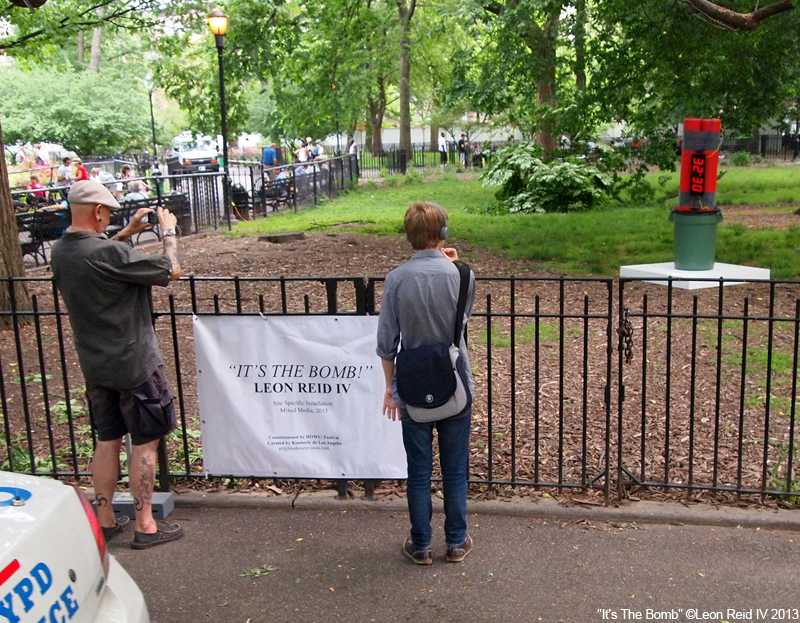 – Allen Ginsberg, "Howl"
On a plot of soil in Manhattan's Tompkins Square Park, a bomb sat in plain view. Four large tubes painted fire engine red stood wired to a digital timer that counted down from 99 minutes. It beeped, reset and started again, never harming anyone. It was fake. 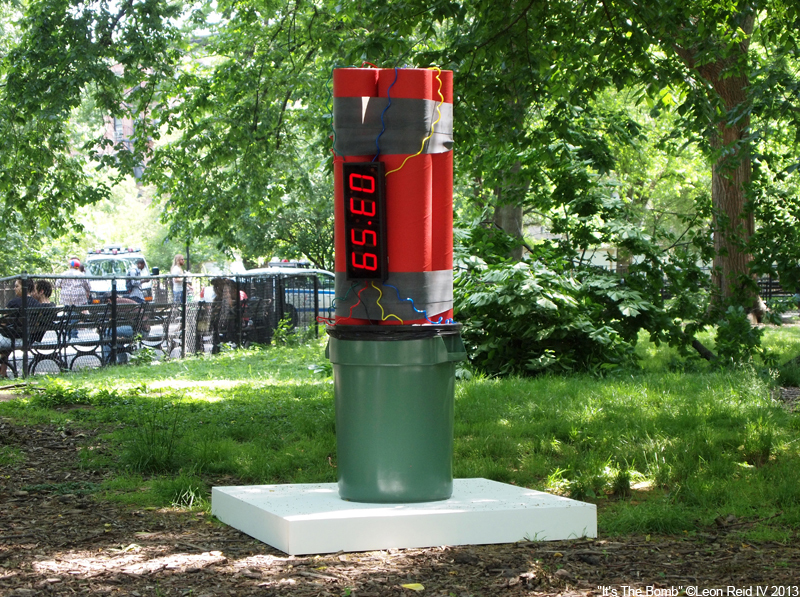 Despite its harmlessness, public artist Leon Reid IV's "IT'S THE BOMB!" was a bold idea. After the Boston bombing on April 15, the fear of this particular evil is fresh in American minds, and coupled with the shootings at Sandy Hook, feelings of public safety are at an extreme low. Even though the installation was part of the HOWL! Festival arts program, an annual East Village homage to Ginsberg, the timing of Reid's choice to make art modeled after explosives was dangerous. While Reid was installing the structure, several undercover police officers approached him. With festival curator Kim de Los Angeles by his side, Reid explained that he was installing a work of art commissioned by Howl (the First Amendment's "freedom of speech" clause protects works of art on public property). One spectator walked by repeatedly, shaking his head and expressing verbal disgust with the work. Someone else tried to dismantle it. Most festival-goers gathered to take pictures and watch the countdown reach zero. Like a haunted house with the lights on, a latent threat exposed left people curious to find out more. And that was the point. Not unlike Ginsberg, Reid is known for striking commentary on the status quo. Depending on subject matter, some of his work seeks to please, some to reflect, some to challenge or defuse. "IT'S THE BOMB!" addresses what he sees as the current state of terrorism hysteria. A recent study found that when our pulses are elevated and hearts contracted — a state called systole — we are more likely to perceive danger where it doesn't exist. When our pulses are settled and hearts relaxed — a state called diastole — we're able to assess potential threats more accurately. "IT'S THE BOMB!" appeared on a relaxing weekend as people celebrated a poet who used art to face his demons. It was a chance for them, and for us, to begin calmly confronting our fears together. I feel like I should find this in bad taste, especially the name. But the thinking behind it, as related here, is something strongly needed. Brilliant piece.